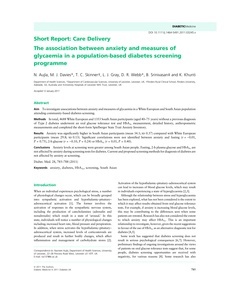 Aim To investigate associations between anxiety and measures of glycaemia in a White European and South Asian population attending community-based diabetes screening. Methods In total, 4688 White European and 1353 South Asian participants (aged 40-75years) without a previous diagnosis of Type2 diabetes underwent an oral glucose tolerance test and HbA1c measurement, detailed history, anthropometric measurements and completed the short-form Spielberger State Trait Anxiety Inventory. Results Anxiety was significantly higher in South Asian participants (mean 34.1; sd0.37) compared with White European participants (mean 29.8; sd0.13). Significant correlations were not identified between anxiety and fasting (r=-0.01, P=0.75), 2-h glucose (r=-0.10, P=0.24) or HbA1c (r=0.01, P=0.40). Conclusions Anxiety levels at screening were greater among South Asian people. Fasting, 2-h plasma glucose and HbA1c are not affected by anxiety during screening tests for diabetes. Current and proposed screening methods for diagnosis of diabetes are not affected by anxiety at screening.